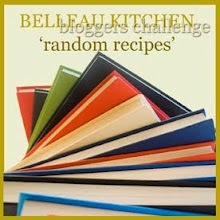 They are both lovely books to read as well as to cook from so it was no hardship to choose a random recipe from one of my new books as requested by Dom at Belleau Kitchen for the Random Recipes Blog challenge. 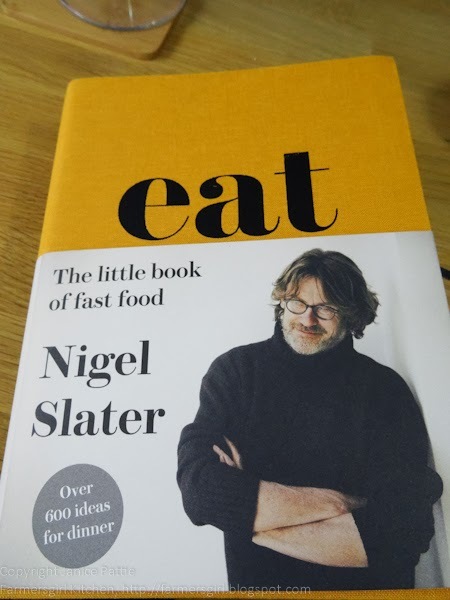 Nigel Slater won the 'eeny meany miney mo' selection and then I just opened the little book of fast food randomly to find myself at the page for chorizo burgers. 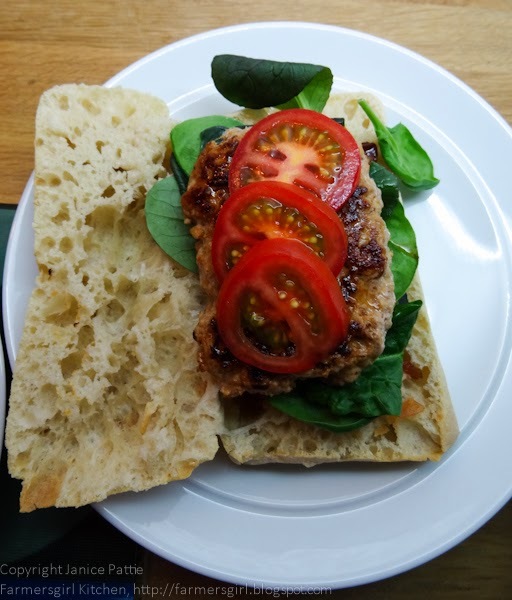 The recipe is copyright so I can't share it in it's entirety but there are only three ingredients: minced pork, cooking chorizo sausages, salt and pepper and ciabatta or pannini rolls. Nigel uses more chorizo than pork, my burgers were more like half and half. 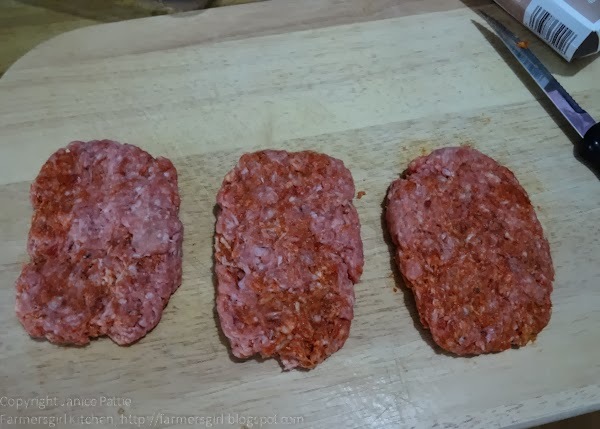 I simply formed the mix into burgers and fried them with a very little oil in a non-stick pan. I made the burgers rectangular to fit better onto the rolls! The burgers were really easy to make on a Friday night, when I would usually stick a pizza straight from the freezer into the oven! The texture was nice and soft and the chorizo sausage gave the burgers a delightful smoky piquancy. I will definitely make these again. 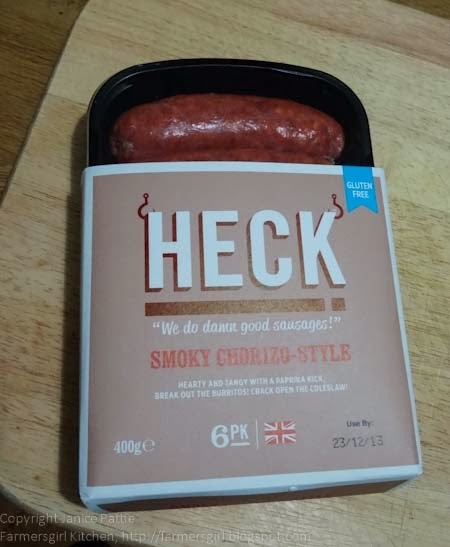 I used Heck Smoky Chorizo style sausages, they have a good flavour and softer texture than some chorizo which made them easy to mix with the minced pork. Please don't be alarmed by the Use By date, they were frozen well before that date and defrosted in the fridge overnight before becoming burgers! @FarmersgirlCook Thrilled to hear this. Thank you. And lovely picture. A lovely random pick. I would have loved to eat a burger like this as well. 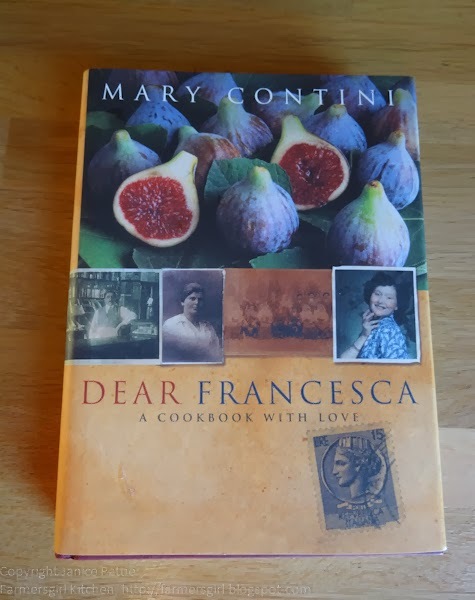 Good Evening Janice, I like the look of the book Dear Francesca by Mary Contini as it looks like an interesting read as well as having recipes. 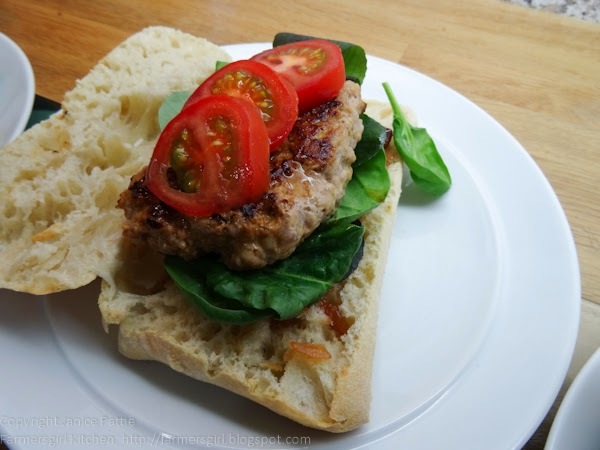 The chorizo burgers look really tasty and I love how you have used ciabatta bread instead of a normal roll.... much nicer.... this is one my hubby will love as he loves chorizo. Thank you for a different take on burgers. Enjoy the rest of your weekend. oooh, nice work!... and very Californian too, they love anything in a sandwich and this reminds me of that... love the chorizo burger so much, great random recipe pick... thanks so much for the entry, thanks for all your random recipes support oh and happy new year! These look like great burgers. I added some chorizo to meatballs once and it made them so tasty so I'd love to try this as well. In fact, I'm surprised it didn't occur to me after the meatballs experiment! What a fabulous idea for burgers! They look delicious! What a great couple of books for Christmas to have received...and the perfect time of year to spend hours in the warm kitchen seeing what they have to offer! A Friday night burger is just about ideal in my opinion and these look great. A very fine random choice. I spotted those sausages the other day and so am pleased to see they are good, mr ak loves chorizo and those burgers would go down a treat here!